When Halloween trick-or-treaters arrive on doorsteps across the United States this Halloween under the guise of spooky costumes, they’ll likely be rewarded with chocolate — lots of chocolate. But in the future, the environment may be the one withholding treats under the threat of something much scarier than a witch costume: climate change. According to researchers, climate change may soon threaten the ability of cocoa trees to thrive and produce enough beans to make chocolate bars for consumers around in the world. Over the next 40 years, 90% of cocoa growing regions will become less hospitable to cocoa trees, according to the US National Oceanic and Atmospheric Administration (NOAA). And some regions of the globe will start to see a reduction in chocolate production by 2030, according to one study. The world's leading chocolate-growing regions, which are mainly located in West Africa and include countries like Côte d’Ivoire and Ghana, are already experiencing climate change-related weather, according to NOAA. Those countries are expected to experience a 3.8°F increase in temperature by 2050, which would make them less hospitable to growing cocoa trees. The farmers who grow and rely on cocoa for income will have to find new sources of income as well, according to Scientific American. Global Citizen campaigns on the United Nations Global Goals, including climate action and ending extreme poverty, two goals threatened by climate change and its effect on cocoa farmers. You can take action to help accomplish the UN goals here. In a report on Canadian news show Day 6, scientist Brigitte Laliberté of Biodiversity International said that the chocolate industry will have to adapt under the increasing threat of drought and disease. "There is no doubt that there has to be adaptability and a change happening in some of the varieties [of cocoa] grown in different parts [of the world], and that requires global cooperation," Laliberté told Day 6..
Laliberté warned that most chocolate comes from only one variety of cocoa tree in Africa. If disease strikes one tree, an entire crop could be vulnerable. Scientists are currently researching how to make a drought-resistant variety. "The more diversity you inject, the better your chances," says Laliberté. "Countries have to work together [...] to share diversity and see what works in different regions." New species of cocoa tree could take years to plant and then bear fruit, she said. 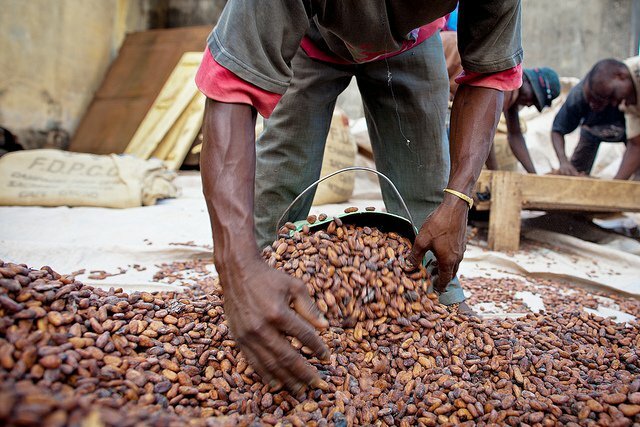 Still, climate change isn’t all bad news for chocolate production. As certain regions of the world become less hospitable to cocoa, other regions will warm up and become more suited to growing chocolate beans, according to a study by the International Center for Tropical Agriculture (CIAT). "Climate change brings not only bad news but also a lot of potential opportunities. The winners will be those who are prepared for change and know how to adapt,” the study said. This Halloween, remember that chocolate will only be there in 40 years if we plan and ensure that it is.